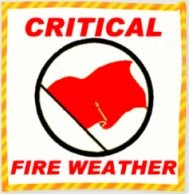 THE RED FLAG WARNING IS NOW IN EFFECT UNTIL 8 PM PDT THIS EVENING FOR CRITICAL FIRE WEATHER CONDITIONS. A STRONG COLD FRONT WILL CONTINUE MOVING THROUGH THE AREA EARLY THIS EVENING. STRONG SOUTHWEST WINDS 20 TO 30 MPH WITH GUSTS TO 50 MPH ARE EXPECTED. GUSTS IN WIND PRONE AREAS COULD REACH 60 MPH. HUMIDITY WILL GENERALLY REMAIN AROUND 20 PERCENT. GUSTY AND ERRATIC WINDS COMBINED WITH LOW HUMIDITY WILL CONTINUE TO PRODUCE CRITICAL FIRE WEATHER CONDITIONS. CONDITIONS ARE EXPECTED TO IMPROVE THROUGH THE EVENING AS THE FRONT EXITS THE REGION. WINDS WILL DECREASE BY 8 PM AND HUMIDITY WILL INCREASE.